← A sorting and sporting week off! The second week of the holidays is almost over and I always have the back to work blues at round about this time. Still, it’s been another busy week. Our big house move has changed complexion quite a lot, and is now only a few weeks away, rather than the original 2 months that we were working towards. How very exiting! We have been up again the house again mowing, weeding and planting up the raised beds gradually, to start our self sufficiency plans. We started with potatoes, tomatoes and strawberries. I ran the 5k series again, yep, I am not meant to, but I was already entered for the whole series before I got the ‘you must stop running’ verdict last week. someone to help me run slower. She said she wanted to beat her time of last week, I said I could help. 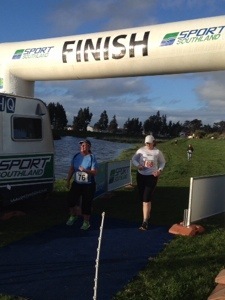 So, I coached her round the run, with a strict run, walk, pacing strategy. She bettered her previous time by 3 minutes! We also went down to the rowing club. Sadly the regatta was cancelled this weekend, but we still made it there on Sunday. Due to masters track cycling starting this week, we didn’t have time to go out on the water so we were coached on the rowing machines. With this view! The track was tough tough tough, but hey, learning a whole new type of racing was never going to be easy. 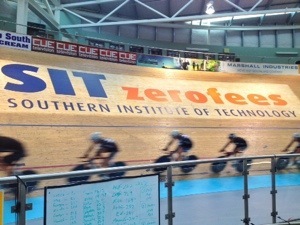 The new sponsor logo is up on the track, and the elite squad arrived for training after us. I am so lucky to have such a brilliantly accessible velodrome right round the corner and a team of experienced coaches so easily to hand. 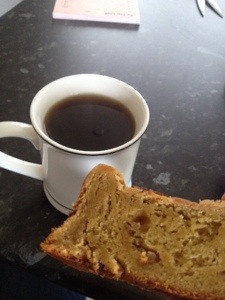 A cuppa and a slice of soreen (which I miss incredibly, a very good friend posted me some!) rounded off a productive week. Now back to reality, unfortunately! 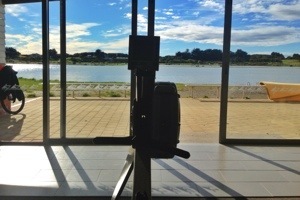 This entry was posted in Invercargill and tagged new house, rowing club, vegetable garden, velodrome. Bookmark the permalink.